A 'Freedom Caucus' for the environment? Republican lawmakers on the Climate Solutions Caucus. Photos by Congress, courtesy of Wikipedia. Republican Rep. Carlos Curbelo fired back yesterday when U.S. EPA Administrator Scott Pruitt dismissed the link between carbon dioxide and global warming (Greenwire, March 9). The Florida lawmaker, who has been speaking out about sea-level rise in his Keys-based district, said the link between CO2 and climate is based on decades of "scientific fact and the reality facing communities like my district." "EPA is tasked with the very responsibility of helping to lower the impact of carbon emissions, and for Mr. Pruitt to assert otherwise without scientific evidence is reckless and unacceptable," Curbelo said. 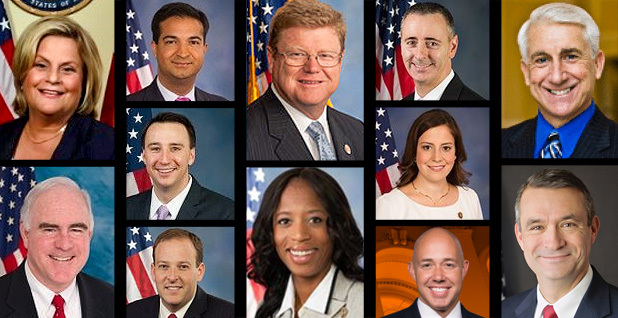 While Curbelo was the most vocal in criticizing Pruitt yesterday, he is not alone: The ranks of House Republicans in the moderate environmental bloc have multiplied in the mere four months since 2016 ballots were tallied. GOP membership in a caucus devoted to climate change has more than doubled since the start of the 115th Congress, growing from six to 14. According to a source, Republican Rep. John Faso of New York joined the Climate Solutions Caucus yesterday yesterday, the most recent addition to the bipartisan group looking at mitigation and adaptation options. Ten Republicans who co-sponsored a resolution committing to work "constructively" to address climate change, "including mitigation efforts and efforts to balance human activities that have been found to have an impact" on warming, won their re-election bids — including in districts carried by Democratic presidential nominee Hillary Clinton. That resolution is expected to be reintroduced, with a bigger base of support. Nine GOP members bucked their party on the recent vote to repeal one of the Obama administration's landmark rules for protecting waterways from coal mining. Eleven Republicans voted against scrapping a Bureau of Land Management rule that seeks to curb greenhouse gas emissions from the oil and gas industry. It's incremental progress, but advocates of climate action are embracing the growth. "If you get 40 Republicans, then you have about the same size as the Freedom Caucus, and I consider that to be a blocking minority within the majority," said Danny Richter, legislative and science director for Citizens' Climate Lobby, a group that advocates for a revenue-neutral carbon tax and dividend plan. 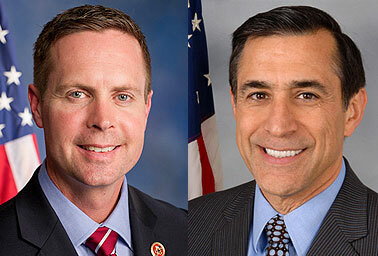 (Left to right) Reps. Rodney Davis (R-Ill.) and Darrell Issa (R-Calif.) are among the newest members on the Climate Solutions Caucus. Photos by Congress, courtesy of Wikipedia. "We all know what the Freedom Caucus can do. They can shut down the government. They can put our credit rating at risk. And so if you get to 40 Republicans who are willing to vote as a bloc for the environment ... at that point this all becomes very, very real," Richter said. Other factors could weigh in their favor. President Trump's approval rating has been coasting below 50 percent. Midterm elections historically do not favor the president's party. While bucking GOP orthodoxy on contentious issues like guns or health care could drive away voters, the 2016 election proved Republicans who distance themselves from Trump on climate can win. In Florida, for instance, voters crossed party lines to re-elect Curbelo and Rep. Ileana Ros-Lehtinen while supporting Clinton. Curbelo co-founded the climate caucus, and Ros-Lehtinen is a member. Both members, who represent Miami-area districts, backed the climate resolution sponsored by retired Rep. Chris Gibson (R-N.Y.). Pennsylvania Rep. Pat Meehan, another GOP supporter of climate action who represents the Philadelphia suburbs, easily beat back a primary challenge from the right. Richter also noted that a month before the election, House Speaker Paul Ryan (R-Wis.) was refusing to defend then-candidate Trump. Republicans have done a good job of unifying since then, he said, but it should not be assumed that Congress will be in lockstep with Trump. "I don't think that reflects the underlying currents," Richter said. Ryan headlined a Miami campaign event for Curbelo in October. Tony Kreindler, senior director of government relations at the Environmental Defense Fund, said he has seen an increasing number of Republicans come to the table to start a new and forward-looking conversation about climate change and the environment since the 2014 election. "I think that reflects their districts, either because of climate impacts, economic opportunity or political reality. You can see it in their voting records and in their support for bills and resolutions that advance solutions, not just rhetoric," Kreindler said. One notable step that may have flown under the radar late last session was the introduction of H.R. 6240, dubbed the "Climate Solutions Commission Act" (E&E News PM, Sept. 30, 2016). Curbelo, Gibson and then-Rep. Bob Dold (R-Ill.) joined four Democrats in the climate caucus to roll out the bill, which would establish a 10-person commission to undertake a comprehensive review of "economically viable" government and private-sector actions that could reduce greenhouse gas emissions. The bill went further than the "Gibson resolution" in that it recognized the need for science-based pollution reduction targets and a way of knowing whether the United States is on track to meet them. A group of conservative elder statesmen, led former Secretary of State James Baker, gave GOP lawmakers additional cover to come out in support of climate policies in the first weeks of the Trump administration. They approached the White House with a revenue-neutral carbon tax and dividend plan dubbed the "Republican climate jailbreak strategy" (Greenwire, Feb. 8). It was met with a thud and panned from the right by Americans for Tax Reform President Grover Norquist, the Heritage Foundation and two prominent members of Trump's transition team, foreshadowing the uphill slog such an effort would face on Capitol Hill (Greenwire, Feb. 16). As long as current House GOP leadership and the Trump administration are in place, "it's hard to imagine any rebellion being realized," said the Niskanen Center's Jerry Taylor. There's a difference, Taylor said, between co-sponsoring an "anodyne and powerless resolution" and voting for something significant, such as a carbon tax. Democratic strategist Jim Manley of QGA Public Affairs said he doesn't buy the "Freedom Caucus" for the environment strategy. "I think that there are some smart Republicans that recognize something has to be done, but the party itself is still dominated by wealthy special interests that aren't willing to deal with climate change issues," said Manley, previously a spokesman for former Senate Majority Leader Harry Reid (D-Nev.). Adele Morris, senior fellow at the Brookings Institution, observed that the environmental left has been reluctant to support pricing carbon in the wake of Trump's election. "What I would like to see from that community is openness to say, 'OK, the [U.S. EPA's] Clean Power Plan is not going to be implemented as we thought it would under a Hillary Clinton administration and now let's engage — let's create the space for a deal,'" Morris said this week at a panel hosted by the Johns Hopkins School of Advanced International Studies. During the GOP presidential primary, Trump said he would oppose any carbon tax or consideration of the "social cost" of carbon, a value underpinning Obama-era climate regulations (Greenwire, March 30, 2016). But Morris hinted Trump could evolve. "Let's not count out the White House," she said.